As a speaker, I can extend $500 savings on the 5-day package. Just use the link above to get that deal. Sort of cool that TechMentor does that. The workshop is extra, above and beyond the regular TechMentor conference but trust me, I will make the session worth your time and investment. Plus, the list of other speakers is pretty impressive, check out who else will be presenting. I am going to sneak in to see Don Jones, Greg Shields, Jennelle Crothers, Jason Helmick, Jeff Hicks, Richard Hicks, Sami Laiho, Mark Minasi - oh wait, those are more sessions than I can fit on my schedule! You get the idea. If you need to understand the dos and don't around IPv6, what could derail you, what problems you might face, how IPv6 is operationally different and how to go about troubleshooting, this workshop is for you. You will walk away with a 60 page workbook and the slides in addition to the actual session content. I will be bringing 3 signed copies of my book to give away too, why not! This workshop covers content I don't explicitly have in my book or in the Pluralsight course I have authored. It really is lessons learned from deploying and working with customers. So come learn how to avoid some of the painful things I have lived through in deploying IPv6 so you can get your project off the ground faster and with fewer issues. I look forward to seeing you there. TechMentor will also be having a private social event on Monday evening (the day of the workshops) and I would love to hang out and talk IPv6. 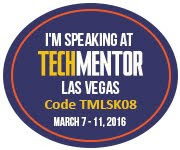 I've always been impressed with the great interaction of TechMentor attendees so I am looking forward to hearing some stories and perhaps sharing one or two myself!